Back in 2009, I put together a highlight reel of quotes and prognostications about Kentucky Derby winner Mine That Bird leading up to his upset victory at odds of 50-1. Needless to say, it wasn’t pretty. This year’s Derby winner, Animal Kingdom, was not nearly the monumental shock Mine That Bird was, but at post time odds of 20-1, he clearly was not on the radar of many bettors. With that in mind, I decided to again comb the prediction columns of some of the racing media’s most notable figures to see where they stood on Animal Kingdom prior to the big race. Like the movie Avatar, Animal Kingdom received mixed reviews, but ended up making all the money. In the end, that’s all that matters. As usual, I will start the proceedings with my own analysis of Animal Kingdom, so as not to give the impression that I am just taking potshots at everyone else. That is what we call a good, old-fashioned swing and a miss. That’s not only a swing and a miss, that’s a swing and a miss from a tee-ball stand, then whacking yourself in the face with the bat on the backswing. Now, let’s take a look at how some of the other members of the turf writing community saw Animal Kingdom. Just for kicks, I have arranged the analyses in a rough order by how favorably they projected the horse’s performance, from non-factor to win threat. Congratulations to everyone that cashed tickets on Animal Kingdom. To everyone else, the Preakness Stakes is only a couple weeks away. There is always time for redemption. The Daily Racing Form reports four jockeys at Pinnacle Race Course have been suspended for ten calendar days after failing a breathalyzer test prior to Sunday’s card. Tommy Molina, Federico Mata, Jeffrey Skerrett, and Wade Rini all registered at least a blood alcohol content of 0.05 per cent, according to Michigan stewards Bob Coberley, Daryl Parker and Richard Garrison. Parker said the tolerance level for riding is less than the 0.08 per cent limit for impaired driving. All of the riders were detained during the remainder of the card while they were given hearings that led to suspensions of 10 calendar days each, which began on Sunday. The article states the tests were conducted before Sunday’s races, which led to Pinnacle’s first race being delayed 20 minutes as horsemen worked to find new riders. Molina was scheduled for seven mounts on Sunday. Mata and Rini were booked to ride nine races, while Skerrett had six mounts. Molina, Mata and Skerrett are currently Pinnacle’s three leading riders by wins. Rini is ranked 18th. Alright, everyone who picked Mine That Bird to win the Kentucky Derby for a reason other than his name, number, silks color or Canadian background, raise your hand. You and I both know we wouldn’t have touted Mine That Bird to our worst enemy. He was a Polytrack horse, and a Canadian one at that. He got butchered in the Breeders’ Cup Juvenile, finishing last by a mile. His only significant win was a Grade 3 at Woodbine – AT TWO. He couldn’t even muster up the athletic capabilities to hit the board in an ungraded stakes race at Sunland Park. Mine That Bird would have been a hard sell for a show wager in the Lone Star Derby, much less the highest-profile three-year old race in the world. Looking through the sea of pre-race predictions, one would be hard-pressed to find anyone who put Mine That Bird in their top 15 out of the pre-scratch field of 20, much less in a spot of serious contention. I’ve seen more optimistic forecasts in a Chrysler exec’s stock portfolio. As a testament to just how out of left field this outcome was, I have compiled some of the more colorful predictions of Mine That Bird’s Derby chances from some of the biggest names and publications in Turf Writing. The results weren’t optimistic. Consider the foot firmly planted in the mouth. Here is what the rest of the Turf Writing community had to say about the Kentucky Derby winner in their pre-race analysis. Just to keep it fair, I limited my search to professional writers and handicappers. These are the people who get paid for their opinions, so one would speculate they would be held in a higher regard. Just imagine seeing some of these clips in a stallion ad if Mine That Bird hadn’t been gelded. So what’s the moral of the story? Never underestimate the longshot? Nope. Be nice to everyone because you never know who is going to hit it big? ‘Fraid not. Never EVER give Calvin Borel a clean look at the rail? Tempting, but no. The lesson here is the betting machines have an “all” button for a reason. 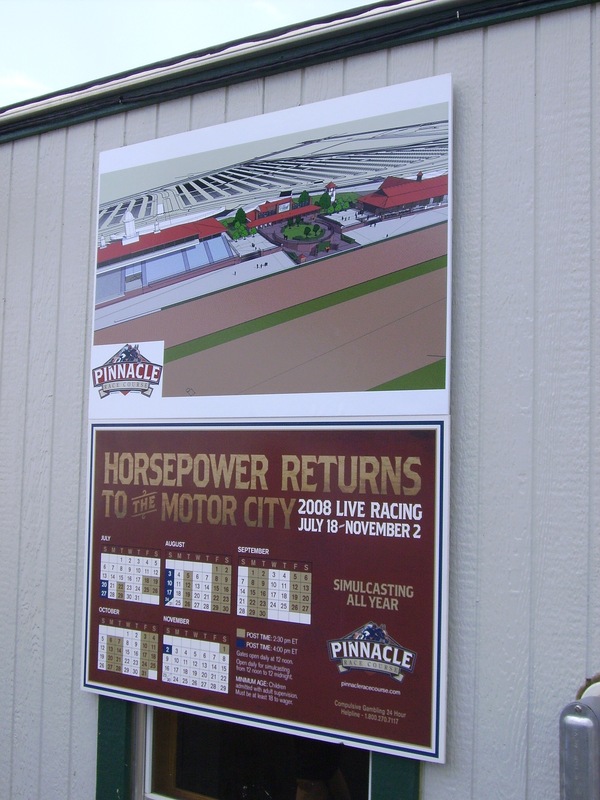 Drawings of Pinnacle Race Course's finished product were displayed around the track during its inaugural season. As anyone who has seen or read about Pinnacle Race Course will attest to, the facility is still a work in progress. The Pinnacle that launched on opening day and hosted the inaugural meet was Phase One of a two, or possibly three, part project expected to be completed by 2010. As it stands, the pavilion, barns, and the track itself figure to be the only permanent fixtures currently in place. For a look at the architectural renderings of the finished track, click here. The drawings are presented in a slideshow format, so stick around for a few moments to see them all. Tom Schramm described the track’s future plans in an article for the Daily Racing Form. Long-term plans – collectively known as Phase 2 – include the construction of a permanent clubhouse, a turf track inside the one-mile dirt strip, and a retail mall on the outlying property. Other plans will increase the number of barns to aid a chronic shortage of horses in the first season. Due to the ailing economy and tight credit markets, some of the plans will likely be delayed. With this in mind, I would like to put you in charge of the decision making at Pinnacle Race Course for a moment. Assuming that Phase Two will not be fully completed by the start of the 2009 meet, which of the proposed additions or expansions would you push to the front of the line to have ready by next year’s opening day? Which ones do you think can be shuffled to the back burner to be finished when the time and money are there? Finally, is it more important to make decisions that will appeal to the patrons on the frontside or the horsemen on the backside? As you may have already noticed, I have also posed the first question in the form of a poll in the upper right hand corner of the page. Please be sure to give that a look and please leave a comment giving the reasoning for your decision as well. For the moment, I will abstain from giving my opinion on the matter so as not to sway the voting in any direction. However, I will certainly share my thoughts in the near future.